Jacamars live only in the neo-tropical rainforest of South America. 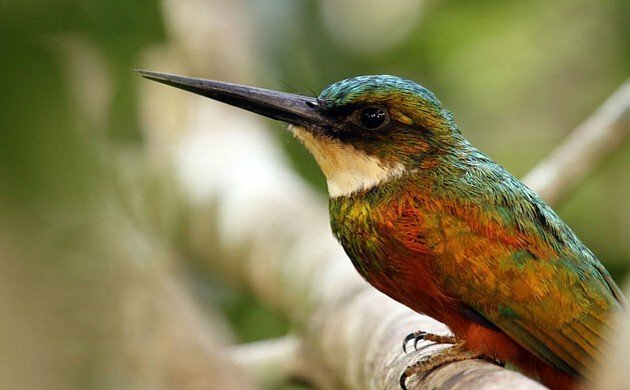 Structurally, they resemble an oversize hummingbird, the coloring is more like that of kingfisher, they act like Tyrant flycatchers, and nest in cavities they dig themselves. Ecologically, they are Tyrant flycatchers in disguise. They perch on exposed branches and sit and wait for passing insects they catch in the wing. 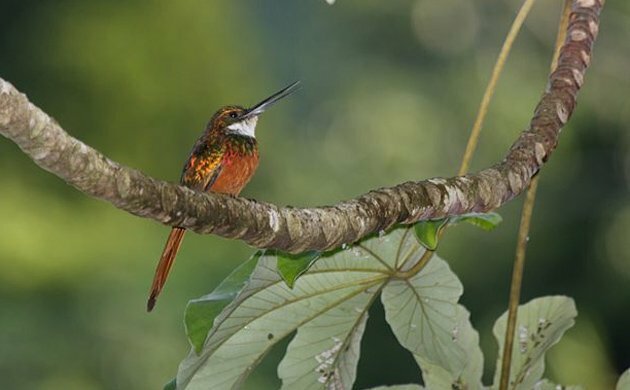 Some folks not familiar with Jacamars in the field may confuse them with hummingbirds due to the iridescent colors and long and thin bill. But unlike hummingbirds, they feed exclusively on invertebrate of the kind that flycatchers and other aerial hawking birds would not dare to go after. These include bumble bees, butterflies of all sizes, and some of the nasty-looking wasps. Flycatchers that specialize in catching insects in the wing generally have a wide gape, flat bill, and well developed rictal bristles (bristles around the base of the bill). A wide gape and flat bill act as a “butterfly net” the larger the rim, the greater the chances to scoop a flying insect. Once a tyrant flycatcher gets a hold of an insect prey, it has to deal with a prey desperately struggling to escape. Here is where the rictal bristles act as a shield protecting the eyes from spiky legs and flapping wings. Jacamars have average size gapes, no frontal bristles, but a very long pointy bill. Their lack of a “butterfly net” like is perhaps compensated by better flying skill that enable them to catch a moving prey in the air. The fact that they specialize in bees and wasps may make things easier on them as bees and wasps have a relatively linear and predictable flight trajectory. Jacamars catch their prey, bring them to a perch, and knock them hard against the perch to quickly immobilize them. They do this by keeping the prey at bill’s tip far from eyes. Struggling insects, even large-winged butterflies are unlikely to reach and potentially damage the bird’s eyes when they are kept and knocked while in the birds bill tip. Jacamars can quickly remove the stinger of bees and wasps prior to swallowing the prey. Tyrant flycatchers Could not come close to handle a stinging prey as they mostly catch and swallow their prey. Jacamars and Flycatcher occurring side by side are a good example of resource portioning in the highly diverse Tropical Rainforest. This is how, many species occupy the same habitat and use seemingly the same foraging strategy. But morphological differences sometimes minor of significant as in the Flycatchers and Jacamars, enable one group specialize in one type of food. And a similar story repeat itself in forest edges, in the understory of the forest interior, mid story, upper canopy and above the canopy. 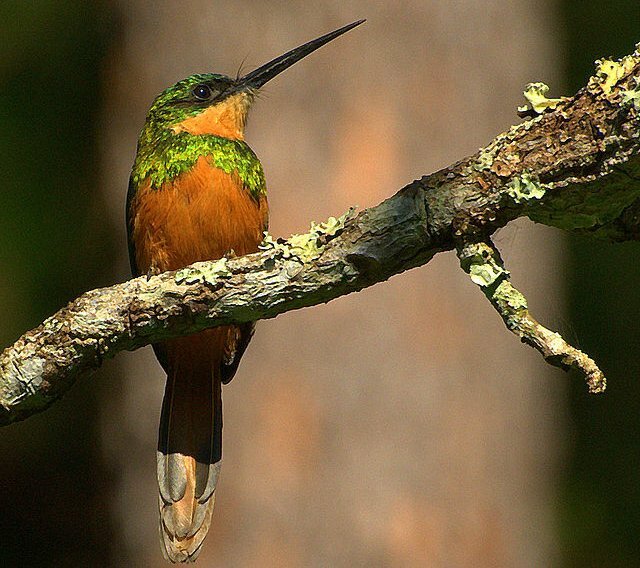 There is a Jacamars and their flycatcher counterparts foraging side by side at just about every portion of the forest. Fun staff! I’d never heard of Jacamars, and now really wish I could see one one day! What fascinating behavior and adaptations. Thanks for a very interesting post. Wow they really are beautiful. They sort of remind me of kingfishers.